The September 2008 issue of The McKinsey Quarterly, the online business journal global management consultants McKinsey & Company, has an interesting article about women and leadership. Centered leadership: How talented women thrive – A new approach to leadership can help women become more self-confident and effective business leaders was written by Joanna Barsh, Susie Cranston, and Rebecca A. Craske. (T)he McKinsey Leadership Project—an initiative to help professional women at McKinsey and elsewhere—set out four years ago to learn what drives and sustains successful female leaders. We wanted to help younger women navigate the paths to leadership and, at the same time, to learn how organizations could get the best out of this talented group. For the project, McKinsey has interviewed more than 85 successful women around the globe (“and a few good men”) who lead a wide variety of organizations. 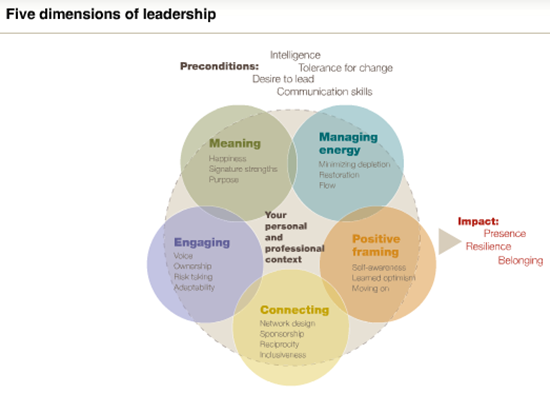 Additionally, they tapped into an equally wide range of resources in the field of leadership and within McKinsey “to learn what drives and sustains successful female leaders.” The project is ongoing, but at this point they have identified five dimensions of leadership and have framed it up in their Centered Leadership model. While targeted primarily at women, this research and the Centered Leadership model would be effective for any leader regardless of gender, race, etc. The following short video is associated with the article and I encourage you to watch this as well. It’s very well produced and the leaders presented are very impressive. Tagged with McKinsey & Company, McKinsey Quarterly, women.